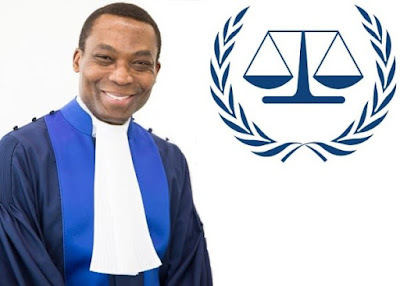 BIAFRA: WILL CHILE OSUJI EXCHANGE THE BLOOD OF INNOCENT BIAFRANS FOR NIGERIA'S OIL WELL? WILL CHILE OSUJI EXCHANGE THE BLOOD OF INNOCENT BIAFRANS FOR NIGERIA'S OIL WELL? History documents, records that immediately the Civil War ended with the declaration of "no Victor no Vanquish " that the Nigerian Army dominated by Hausa Fulani went to a community in the present Mbano, Imo State gathered the youths of the community in a field pretending to select gallant youths who would be useful to newly united one Nigeria. But the incredible happened! Majority of these youths were shot to death by Nigerian Army and that was after the War in 1970. Coincidentally, that community today is where the incumbent ICC President Justice Chile Eboe Osuji hails from. Money is the root of all evils according to a Biblical saying . In one of his statements of the genocidal war criminal Yakubu Gowon was once quoted as saying that " if he had known, he would not have spent one naira in buying guns. That money would have been given to some Igbo leaders to fight themselves " One wonders if Chile Eboe Osuji is going to fall at the circle of Yakubu Gowon assumption? Prior to his assumption of office in 2015, President Muhammadu Buhari government has characterised his government by killing innocent people who are not even armed through the Nigerian Armed Forces and well politically organized killer herdsmen. These killings were masterminded by his cohorts heading the different Arm Forces in Nigeria. The Nigerian President Muhammadu Buhari is a core Northern Muslim who believes in conquering through killing. No wonder, he appointed the Northern Muslims as the heads of the security agencies in Nigeria. These heads of security agencies collude with the arm bandits to kill innocent souls. No arrest has been made nor proscription just like they did against IPOB. However, the killings of innocent Indigenous People of Biafra, with glaring evidence are at the feet of ICC panel of investigation in Hague . The killings of unarmed IPOB have attracted reactions from international Human Rights organisations of which one of them is Amnesty International. These killings took place at Onitsha, Port Harcourt, Aba, Enugu, Isiala Ngwa, Asaba and of recent Afara Ibeku Umuahia. These were captured on camera, Facebook and social media outfits . The hope of these innocent souls arrested, killed and shot by the Nigerian Army and Police lies in the justice and equity of the internationally set up organisations against human rights abuses. Nigeria has metamorphosed into a failed State and no human being will expect anything good or hope in the Nigerian court of jurisdiction that is hiding in the bedroom of politicians cementing evil in the name of making money. Now that justice Chile Eboe Osuji is the President of International Criminal Court at Hague, will he exchange the blood of innocent Biafrans with dollars or oil wells as alleged by Yakubu Gowon? Only time will tell . As he has visited Nigeria , we pray that he must have understood that charity begins at home. There are high hopes that justice without tribalism and favouritism will be accosted to the cases between Nigeria and Biafra . The lions are hungry and the nemesis await the killers of innocent IPOBs. Woe to whom that will divert the atrocities of Nigerian against innocent people because of dollars or oil wells.